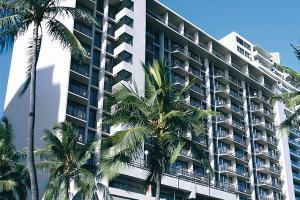 AAA Three Diamond contemporary boutique hotel located one block from the beach and a short stroll to Ala Moana Shopping Center and the Hawaii Convention Center. This hotel offers the following free amenities: high-speed Internet and Wi-Fi access, AquaBLISS pillow top beds, 42" wall-mounted LCD TVs, local & toll free calls and microwave. AquaSPA facilities, BBQ grill and a fitness center are located poolside. Located just steps from world-class sand beaches, Oceanside dining, shopping and the bright nightlife that is Waikiki. Approximately 30 minutes from the Honolulu Airport. IHOP on-site and restaurants Nearby.